SSS member Jerry A., Hallman, USAF (Ret ) 79 headed west after a six-week battle with lung cancer. Jerry died peacefully at home in Gulfport, Florida, on July 8, 2018, surrounded by love. Jerry was born on May 2, 1939 in Fort Valley, Georgia and graduated in 1957 from Fort Valley High School. 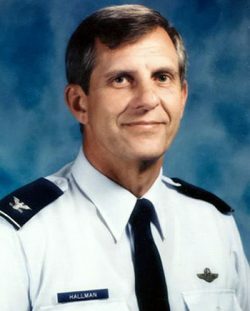 In 1963, he graduated from Auburn University and received his commission as a 2nd Lieutenant in the United States Air Force. Aiming high, he won his pilot wings in 1964 and proudly served his country twenty-four years as a fighter pilot. Jerry served as an F-100 pilot with the 510th Tactical Fighter Squadron at Bien Hoa AB, South Vietnam from December 1968 to September 1969, and later as a Misty Fast FAC F-100F pilot from May to September 1969. He completed his military career as Director of Inspection in the Office of the Inspector General, and as Director of Reserve Force Readiness. One particular assignment during that time led him to Nebraska, where he crossed paths with a certain Lieutenant Colonel Bonnie Carney. She became the love of his life and their 32-year marriage was full of family, faith, laughter and adventure. He relished a great game of golf and captaining his boat, “Flying High.” His playful shenanigans were famous among his kids, grandkids, great-grands, nieces and nephews. He cherished his friends and comrades and his loyalty to God, family, and country was evident to all. Jerry was preceded in death by his parents, James Hubert Hallman and Sarah Estelle Hallman. In addition to Bonnie, Jerry is survived by his children: Kimberly (Bob) Busby, Jeffrey (Joanne) Hallman, Stephani (Jeff) Wyatt, Jennifer Noble, Christine Carney and Julianne Carney. Jerry delighted in his grandchildren: Brandon (Michelle) Maldonado, Brooke Busby, Jason Busby, Jessica Brentnall, Jackson Noble, Avery Noble, Piper Noble, June Carney, and great-granddaughter, Brinlee Maldonado. Jerry is also survived by his sister, Dena Patterson, brother-in-law, Joel and their daughter and grandchildren, Amanda, Cameron and Carly Smith. Services to remember and celebrate Jerry’s life will be held in St Petersburg, Florida at Maximo Presbyterian Church on Saturday, July 21 at 2 PM, and on Hilton Head Island, South Carolina, at First Presbyterian Church on Sunday, August 19 at 3 PM. Col. Jerry A. Hallman will be laid to rest at Arlington National Cemetery with full military honors. Memorial contributions in his honor would be gratefully received at the EOD Warrior Foundation. David C. Gross Funeral Home, Central Avenue Chapel in St. Petersburg is serving the family.